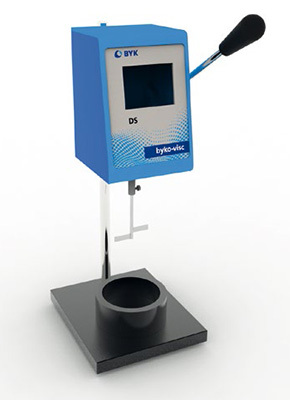 The byko-visc DS has a direct digital readout of Krebs units (KU), centipoise (cP), and grams (gm). The instrument rapidly calculates viscosity values. The digital stormer maintains the rotational speed at 200 rpms in compliance with ASTM D562. The viscometer automatically starts and stops the motor shaft rotation by lowering or raising the instrument stand.